Craig has been involved with the Music Time family in a variety of ways (band mate, piano tuner, substitute teacher) since 2014. We are thrilled that he now joins us as a regular staff instructor on Tuesdays, teaching trumpet, piano & organ. Craig specializes in improvisation, Jazz, Blues, Soul and is our first ever organ instructor! 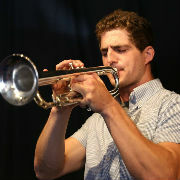 Although he has studied piano since the second grade, Craig only began on the trumpet as a teenager. Always serious about learning and growing as a musician, he attended the prestigious Berklee School of Music in Boston, earning a Bachelor’s Degree in Professional Music (a rigorous course of study that emphasizes performance on both trumpet and piano, as well as music business). Since returning home to the Bay Area after attending Berklee, Craig has made a full-time career for himself in the music industry. As a well-rounded professional, Craig not only performs and teaches music, but also owns & operates his own piano tuning business, Berletti Piano (which comes highly recommended by Music Time Academy). Craig currently performs locally with a wide variety of musical groups. Once a member of Lost Dog Found (a popular swing band), Craig’s can presently be seen playing organ at a church in Martinez every Sunday. He is both an organist & trumpeter with Jeremy Jones Band (Swampedelic Rock & Soul, also featuring Anna from Music Time), as well as leading his own jazz ensemble, All of Us, that currently hosts a monthly open jazz jam night at Armando’s in Martinez. Craig is also a member of Motown/Soul cover band West Grand Boulevard, in addition to frequent gigging with various other local musicians and bands. Welcome to the team, Craig! We are happy to have you here.